How good is it to be a Killie fan right now? That answer to that is simple, it is fantastic! Now pass me that jug of cold water for a bit of a reality check. Matters on the pitch seem otherworldly at the moment and the new additions to the Club Board off the pitch have certainly livened things up as well, but how sustainable is this Killie resurgence and what can we do to keep it going as long as possible? Therein lies the big money question…and the answer is ironically, big money. Football clubs generally have peaks and troughs and the trick is to push the boundaries when you are on the up so that the inevitable crash is less significant and the ‘rebuild’ easier to bring about. Successful (and unsuccessful) managers tend to move on quickly and as much as we definitely are all enjoying the wonder that is Steve Clarke while he is here, we are all secretly dreading the day that he has to be replaced. Apologies for even mentioning that, but nothing lasts forever, apart from Ayr United’s trophy-less run. We can’t hold on to the big man indefinitely, but we can benefit from his time here and we can use that wisely and plan for the future with his guidance. The last thing we want is to have a couple of glory years and then leave his legacy to chance. As good as it is going toe-to-toe with the so-called ‘big’ teams and having no fear at the prospect, I would urge some thought be given to what lies ahead and how we can maintain our current high and do it in a sustainable fashion that will not leave us in debt again or even worse, in the grubber. Many fans are expecting the club to lift the artificial pitch and replace it next season when we get a new training facility, which is fine apart from the fact we can’t afford a new training facility. The current surface is nearing the end of its shelf life and it would cost an absolute fortune to rip it up and put in a proper grass, never mind a hybrid, pitch. The truth of the matter is that we will be stretched even paying a couple of hundred grand for a direct replacement. There are going to be a lot of disappointed fans out there when they realise that idealism comes with a hefty price tag. Then there’s the SFA and our inclusion in Project Brave. Lots of unnecessary wages and a training complex that includes a three quarter sized indoor synthetic pitch, a full sized outdoor synthetic pitch and at least one full size grass pitch. We have been ‘lucky’ enough to be selected as one of the clubs that will spearhead this nationwide initiative and save the future of Scottish Football. Sorry for the language, but balls to that, despite the fact we are allegedly only one contract away from meeting the criteria…one too many if you ask me. Project Brave is a complete non-starter in my opinion, and in the opinion of most football clubs in Scotland. This Utopian master plan is just too expensive for most clubs to afford and the SFA will end up having to scrap it or completely change the current guidelines. Forget it, it is a waste of time and we should not even be considering it, we are probably only playing along safe in the knowledge that the goalposts will at some stage be moved, and there is no harm in staying involved up to that point as there might be something in it for us later. That does not take away from the fact that we still need proper training facilities if we want to keep our players on top form and fighting at the right end of the table. The players deserve the best we can afford and Steve Clarke deserves no less. The problem is, despite the current resurgence in interest and the on-field heroics, we just do not have the funds available to build what is required and it would be grossly unfair to assume our current directors, whom have already splashed a lot of their own cash, should stump up the millions we are going to need. How can we expect our current manager, or any who follow him, to get the best for our club if we can’t even provide them with up-to-date coaching facilities? Sadly there are no easy answers. Attracting big money investors is an obvious option but we have been there before and that well is all but dry. Selling all our best players wouldn’t bring in enough, and kind of defeats the purpose. The Board have an unenviable and near impossible task of not only trying to raise enough money to provide the necessary facilities, but to manage the expectations of a fan base on an unprecedented high. No one wants to think about practicalities when we are sitting in a lofty league position and don’t look like we have even got out of second gear yet. This is not an attempt to depress you with pragmatism, this is a wakeup call that we have to strike while the iron is hot and do something now, not later. The proverbial lottery win is out of our hands, but that is not to say we should just accept what is deemed to be our lot and not aim high. Steve Clarke’s mantra has been “together we are stronger” and as per usual the big man has got it right. The only way we can secure the future of our football club is to start chipping in ourselves and looking for ways to raise the funds which are needed. The majority of Killie fans are already contributing in some way, and the obvious thing to do is to encourage more people to support their local team and spread the load. More ticket money, more strip sales, more sponsorship, more hospitality…with more fans all that becomes achievable and certainly helps us on our way…but it is not quite enough. The Foundation of Hearts have just announced they’ve reached £8m worth of donations, which is enviable to say the least and understandable as they are a big city club; but that’s not to say we couldn’t emulate that, albeit it might take a bit longer and we might need a few generous cash injections along the way. Last year the Trust in Killie initiative raised in excess of £100k with only 250 fans contributing on a regular basis. With 4,000 fans we could have raised £1.6m which is not too shabby when you think about it, but obviously still well short of the mark. Does that mean to say we shouldn’t go for it anyway? Of course not, it’s money in the bank for the club for free and to make more money you need money to start with. If you think this is a sales pitch for TIK you’d be partly right, to be fair though its more of a sales pitch for everything Killie related as it is all going in the same pot and all counts toward our goals. The new £10 TIK entry level has been launched already at your request and the Trust will soon be giving it a big push. The bottom line here is that we need our fans to buy into this as much as they are buying into attending games again. 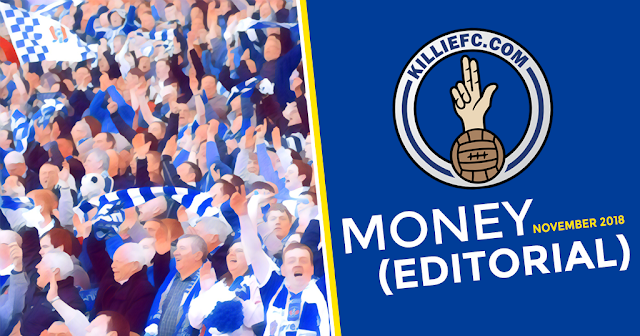 It’s fantastic that we are on the cusp of selling out three away matches on the bounce…but how much money does Kilmarnock FC make out of that? It’s brilliant, but it’s not profitable, we need to sell out Rugby Park, and I mean with our fans, not old firm fans…would that even be possible? I don’t see why not, not in the long term at least, and a few short term hits in the meantime would not go amiss.